The building housing your database will require a non-changing IP address for its Internet connection. Most of the instructions below contain Windows-specific instructions, however, the principal is the same for any computer. Before making any changes, however seemingly small, we recommend that the database be backed-up. We recommend the use of a portable USB drive, or similar. A backup location which can be taken off-site. Select the destination where to save the backup. Select Backup Now. When complete, a popup message will appear to that effect. Safety check – Open the destination folder, and check the size of the file just created. Should be greater than zero. On Windows (Vista, 7, 8+), open the Network and Sharing Centre. Select the ‘Local Area Connection’. Select ‘Details’ to obtain MAC address of PC, and ‘Default Gateway’. Record these for later. Close windows back to ‘Local Area Connection’. Select Properties. Highlight IPV4, select Properties. Select ‘Use the following IP address’. Type in the desired IP address and record this for later. We recommend one which is many numbers ahead of the current IP address. By default, most routers start allocating IP addresses with low numbers, for example: 192.168.0.1 onwards. We recomend selecting one with a high number, for example: 192.168.0.100. This helps if the router is replaced, and the settings are not the same. Type in the ‘Subnet mask’ and ‘Default Gateway’. OK to save and close. In the left pane, click Advanced settings. Administrator permission required If you’re prompted for an administrator password or confirmation, type the password or provide confirmation. 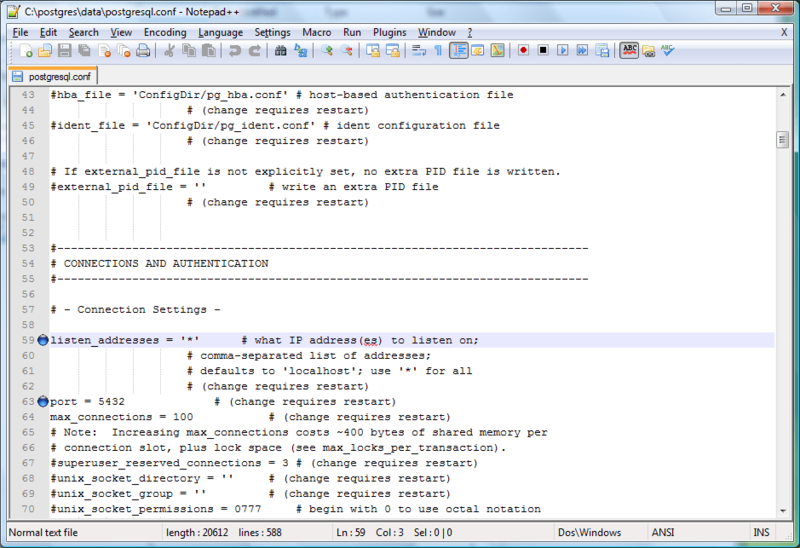 Scroll down to find ‘Postgres’, tick the ‘Allow’ box. If ‘Postgres’ is not present, make a new rule, allowing incoming traffic on port 5432. This is a safety measure. All router user-interfaces are different. Usually found in ‘DHCP’ section, or similar in the router configuration menu. Google search for ‘router-model-number + Set Up a Static IP Address’. Use previously recorded MAC address and database PC IP address. Open any browser, type into the address bar the IP address of ‘Default Gateway’ previously noted. Enter user-name and password. Most routers have a user-name/password requirement for access. These are frequently not changed away from default. Google search for ‘router-model-number + default password’. Reboot router. Check all IP addresses for correctness. Open the Windows File Explorer, navigate to C:\postgres\data. Select pg_hba.conf, and open for editing. Select postgresql.conf, and open for editing. Restart the computer to ensure all changes are set. Ensure Postgresql service is running: Start -> Control Panel -> Administrative Tools -> Services. Scroll down to find ‘Postgresql’ or similar. Should be running already. Ensure Postgresql service is running, as above, on the target database computer. Check this before you leave the building! In the system tray, click the GymMaster Launcher, select Launcher Settings. Follow the general instructions above for setting up static IP addresses and for port-forwarding. Then open the file explorer program. 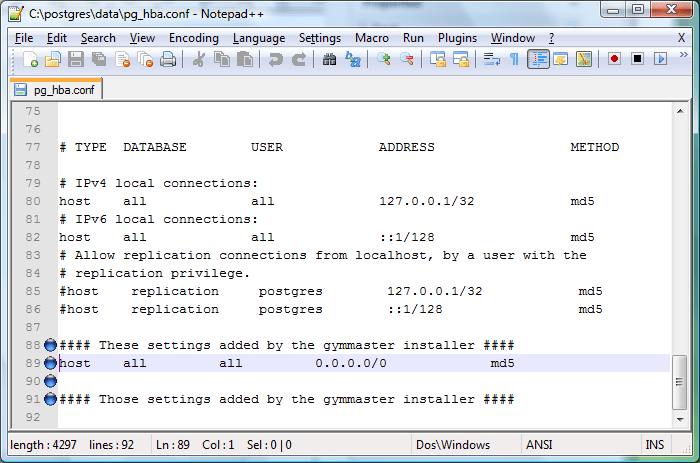 You should now be able to run GymMaster to access the database remotely, eg: from home or a different office.